Ohio Wesleyan University will reinstate men’s wrestling and add women’s rowing as varsity sports for the 2018-19 academic year, it was announced by athletics director Roger Ingles. Ingles anticipates having head coaches for the two sports in place by July 1. Both head coaches will begin recruiting student-athletes during the summer of 2017, the teams will compete as club sports in 2017-18, and varsity competition will begin in 2018-19. The return of men’s wrestling and the addition of women’s rowing increases Ohio Wesleyan’s complement of varsity sports to 25, with 13 for women and 12 for men. They are the first varsity sports to be added at Ohio Wesleyan since 2010, when women’s golf was added for the 2010-11 season. 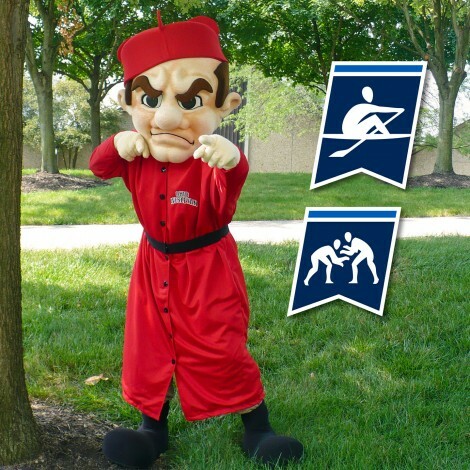 Ohio Wesleyan becomes the first North Coast Athletic Conference institution to sponsor women’s rowing and the second NCAC institution to sponsor men’s wrestling, joining Wabash College. A total of 102 NCAA Division III institutions sponsor men’s wrestling, and a total of 42 NCAA Division III institutions sponsor women’s rowing. The NCAA sponsors Division III championships in both sports. Wrestling was a varsity sport at Ohio Wesleyan from 1954-84. Ray Leech ’49 began the wrestling team when he joined the Ohio Wesleyan faculty in 1954 and oversaw it for 30 years, coaching 16 Ohio Athletic Conference individual champions along the way. In 1984, with Leech retiring and Ohio Wesleyan leaving the OAC to help form the NCAC, wrestling was discontinued. Possible sites for women’s rowing competition include Hoover Reservoir, on the Scioto River in western Delaware County, and Alum Creek Reservoir in eastern Delaware County. President Rock Jones said expanding the number of varsity sports also fits with Ohio Wesleyan’s commitment to the liberal arts and to graduating well-rounded individuals.